The operators manually scrammed, or rapidly shut down, the Unit 1 reactor at the Susquehanna nuclear plant near Berwick, Pennsylvania, at 2:41 pm on July 16, 2010. The reactor had been operating at full power until flooding was indicated in the Unit 1 turbine building. Sensors mounted to the walls of the turbine building detected water accumulation and triggered warning alarms in the control room. Workers responding to the alarms identified water leaking into the turbine building from two separate condenser manway door seals. The condenser is a large metal box located directing beneath the main turbine. Steam leaving the turbine after having spun the turbine’s blades to rotate the shaft within the main generator to make electricity—the whole purpose of the plant—enters the condenser. Water from the cooling tower basin flowing through thousand of metal tubes inside the condenser cools this steam to convert it back into water. This water collects in the lower region of the condenser where pumps remove it and send it back to the reactor vessel to make more steam. The warmed water in the cooling tubes is sent to the cooling tower to be cooled by air flowing up through the concrete chimney of the tower. 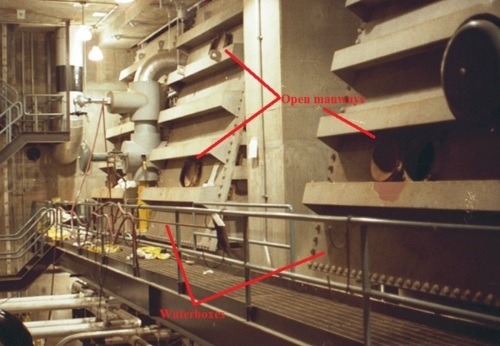 The condenser has several metal doors, called manways, that workers access to inspect and clean the condenser and its tubes when the reactor is shut down. The picture shows the condenser at the Browns Ferry nuclear plant in Alabama—a sister plant to Susquehanna. The picture above shows three open manways. Each has an elastic seal made of neoprene rubber to limit leakage paths between the metal door and the metal condenser walls. Workers had not properly installed the seals on two manways, allowing the seals to become dislodged. Once this happened, water poured out of the condenser onto the turbine building floor. The leaking water was the non-radioactively contaminated or “clean” water flowing through the condenser tubes to the cooling tower and back. This water was drawn from the Susquehanna River and replenished with river water as needed. Susquehanna’s condenser is physically separated into three parts, called waterboxes. The leaking manways were located on one of the three waterboxes. Workers were slow in identifying which waterbox was leaking. Once they identified the source of the leaks, workers were unable to stop the leaking because the motor-operated valves used to isolate flow into that waterbox failed to move when worker pressed the “Close” control switches. Nearly one million gallons of water leaked into the turbine building, flooding its basement with nearly 12 feet of standing water. Fortunately, the turbine buildings at Susquehanna are designed to withstand flooding up to 20 feet, so this event was within the plant’s design capability. As a result, the leaked water did not disable any safety-related equipment needed to shut down and cool the reactor core. Shortly after our first Fission Story was posted on July 6, 2010, some nuclear power proponents began criticizing UCS for rehashing old news simply to make the allegedly stellar nuclear industry look bad. And indeed, Fission Stories #2, The Mistake by the Lake, was posted on July 13, 2010, and described events in 1991 and 1993 at the Perry nuclear plant in Ohio where failures caused flooding of plant buildings. Less than 72 hours after this posting, a similar problem flooded the Unit 1 turbine building at Susquehanna with 12 feet of water. A key lesson from these events is that leaks happen and a key component in their severity is how quickly the sources are found and isolated to stop the flooding. The flooding at Susquehanna was more severe than necessary because workers were slow in pinpointing the leak locations and then unable to get equipment to function properly to stop the leaks. In this case, the flooding was stopped before it caused serious problems, but event like these should be used to take steps to prevent a recurrence. There’s a lesson there, but only if this takeaway isn’t treated like a hideaway.